We will be collecting video footage in order to create a promotional video to announce Kindergarten Registration in 2018. Any families that submit raw footage will have their child’s Kindergarten class entered for a chance to win a pizza lunch party (we will accommodate allergies or food restrictions if necessary). Videos will be able to be submitted until December 8, 2017. Parents/Guardians must complete a Video Contest Release Form by going to their PowerSchool Parent Portal, clicking on the “Fees & Forms” link, and completing the electronic “Kindergarten Video Contest Release Form”. Videos submitted without the completion of this form will not be used. 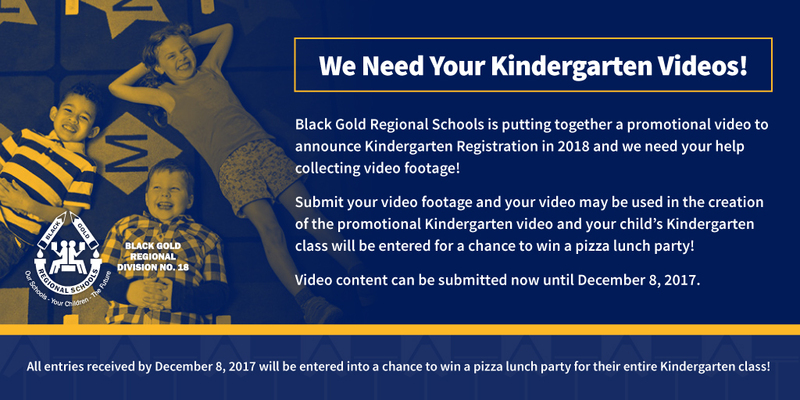 Use your mobile device, camera or video recorder to video your child (who currently attends Kindergarten in a Black Gold Regional School) while asking them questions about Kindergarten. Please do not add graphics or music to your clips or submit any copyrighted material. We are looking for raw footage that we can edit into one unified promotional video. What are two words you would use to describe Kindergarten? What is the greatest thing about Kindergarten? What activity do you like doing most during Kindergarten? What’s your happiest memory from Kindergarten so far? You must complete the Video Contest Release Form by going to your PowerSchool Parent Portal, clicking on the “Fees & Forms” link, and completing the electronic “Kindergarten Video Contest Release Form”. Next, visit our Dropbox at: https://goo.gl/g5nrQw to upload your video. Be sure to name the file the same as what you included on the Video Contest Release Form. All entries received by December 8, 2017 will be entered into a chance to win a pizza lunch party for their entire Kindergarten class!